We’d like to take the opportunity to introduce to you the new FiltoSmart external filters from Oase which have become available from us recently. 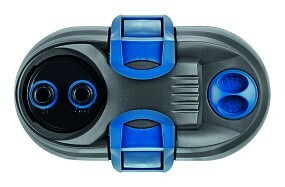 Apart from the small FiltoSmart 60 the series is comprised of the three models FiltoSmart 100, 200 and 300. Here, the number indicates the maximum aquarium size in liters, which can be operated with the respective filter model. 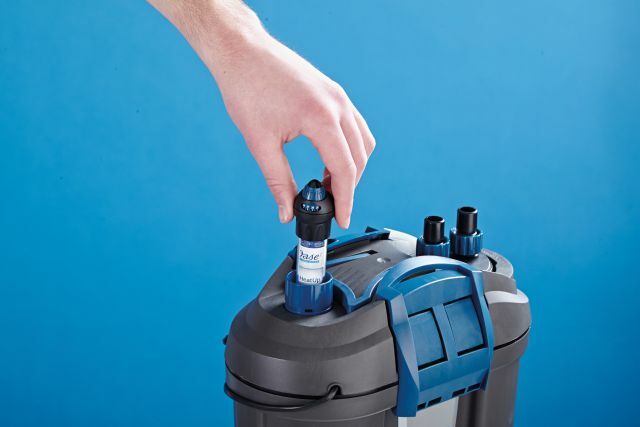 For significantly bigger tanks with up to a volume of 600 liters, the BioMaster series is recommended. The FiltoSmart external filters are chracteristically space-saving and sleek in design. This leaves much more space in the aquarium cabinet. A special base, included with the filters from the “100” onwards, ensures sufficient stability. The FiltoSmart 60 can also be used as a hang-on, when a seperately sold mounting bracket is used. 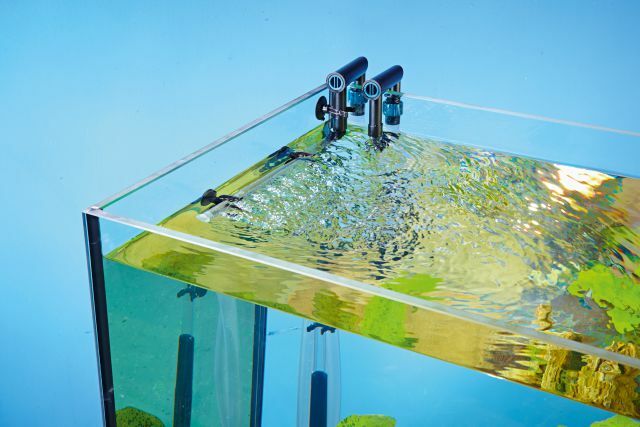 This is very practical for small nano aquariums, that don’t have their own base cabinet. The models FiltoSmart 100 to 300 are also available as thermofilter variants or easily retrofitted with a suitable HeatUp-heater. 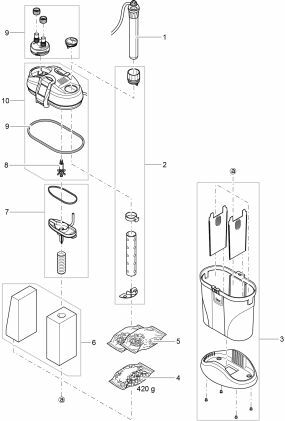 In addition to the space-saving advantage, the handling of possible defects in the heating unit is very thoughtful, indeed: It is not necessary to send in the whole unit for repairs, just the heating element is replaced. 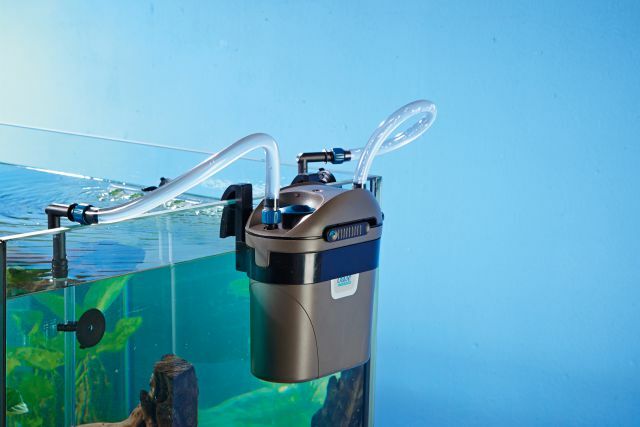 The external filter can be equipped with various materials for mechanical, biological and chemical filtration. Various-sized filter sponges, activated carbon and ceramic substrate can be used in the canister and are included as an accessory. For this, the materials need to be removed from their packaging before use in the filter. Up to three chambers can be loaded with different filter media. Also included in the scope of delivery are a suction- and outflow unit, which are connected to the canister with a hose respectively. 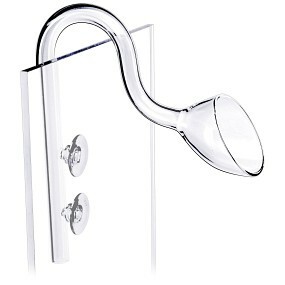 Both units include a U-shaped hose guide for installation over the tank’s rim. There is also a valve for flow regulation. With regard to the filter outlet you also have the choice between a classic jet pipe or a water distributor with a slightly more punctual flow. Depending on the model, standard hose sizes (9/12, 12/16 and 16/22 mm) are used. So, a FiltoSmart is compatible with all common Lily Pipes in the sizes 10, 13 or 17 mm. 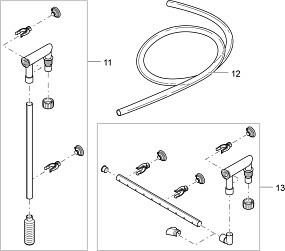 Once the hoses and pipes are connected with the filter, it can be put into operation. For this, the canister is filled with water through a special inlet (in the thermo version that would be the hole for the heater). After closing, the filter can be connected to the mains. 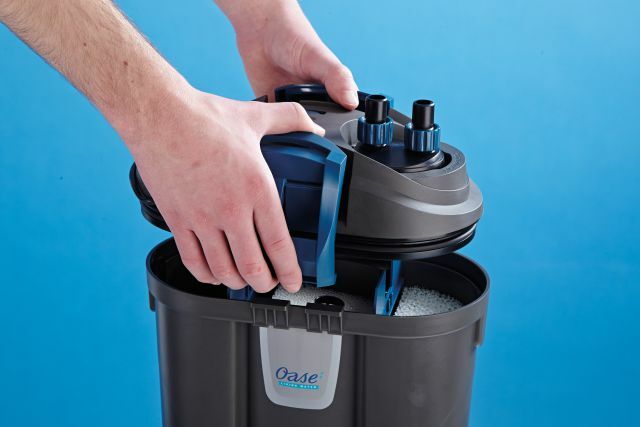 The automatic self-venting ensures that any remaining air bubbles are removed from the canister. This makes the start-up much easier. Oase FiltoSmart, top view. On the right: the opening for filling the canister with water. Left: hose connection unit. 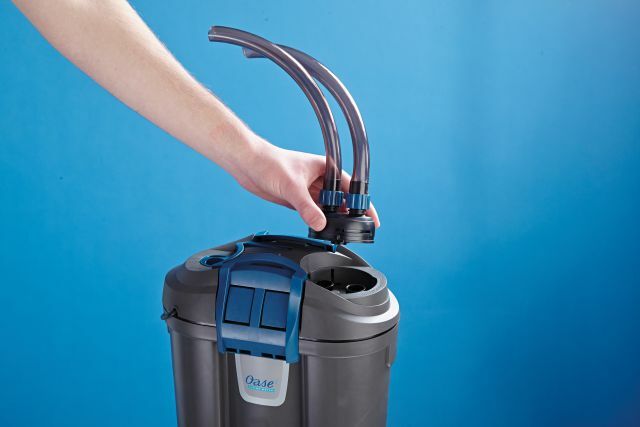 Cleaning the filter can be done in a few simple steps. After disconnection from the mains, the connection unit is unlocked and removed from the housing (the hoses stay connected during this). ...and lift the top of the housing to reach the filter media inside. Important for a long life and good service is, of course, an extensive range of spare parts. 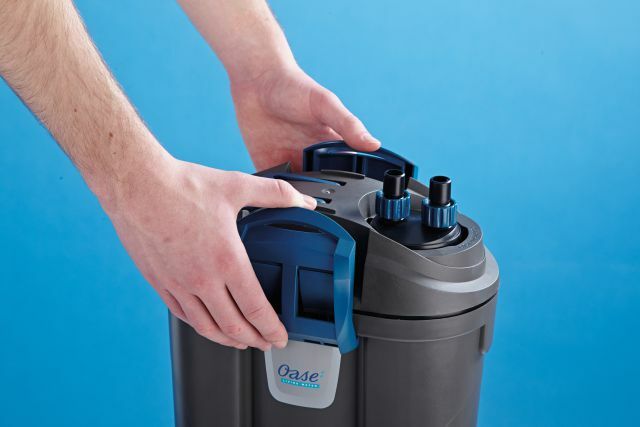 The Oase homepage offers an overview of all available spare parts for every available model. All parts are numbered, illustrated and marked with their corresponding item numbers.